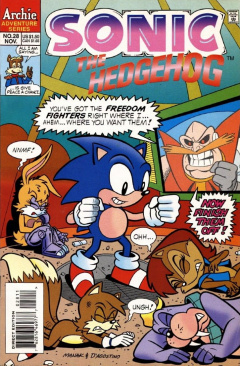 Sonic the Hedgehog 28 is the twenty-eighth issue of the Sonic the Hedgehog comic series. It was released in November 1995. This comic features two stories: Saturday Night's Alright for a Fight, and Growing Pains. Sonic the Hedgehog, having been brainwashed by Dr. Robotnik, has successfully infiltrated Knothole Village. Sonic has arrived at Rotor's lab, where both Rotor and Sally Acorn are present. With the possibility of Robotnik determining Knothole's location via Sonic, Sally must act fast to get rid of Sonic. She starts by asking him if anything is wrong, but he doesn't fall for her kindness. He rushes at full speed and rams into Rotor, sending him flying into one of his computer consoles. He then runs around him, hitting him with a flurry of punches. After Rotor is down for the count, he runs behind Sally and grabs her by the neck, intending to break it. She grabs his arm, getting a good grip, then throws him away. Outside the lab, Tails and Bunnie Rabbot come running in after hearing the commotion. They look in to see Sally and Sonic continuing to fight, but don't suspect foul play. Bunnie runs in and grabs one of Sonic's arms before he can punch Sally. Using one of her robotic legs, she pins down Sonic, while Tails arrives, asking what Sonic is doing. Bunnie's strength is not able to hold Sonic for long, as he spins and sends everybody flying back. Tails, in mid-air, gets his tails working and tries to fly away, but Sonic is able to catch up and knock him out with a spindash. He looks on in triumph, as the Freedom Fighters remain knocked out all around him. Back at Robotnik's lab, Snively commends Robotnik for winning his battle, but not all is well. Despite Sonic being a brainwashed pawn that successfully infiltrated Knothole, the village has a signal jammer that is preventing Robotnik from finding the exact location of the village for him to destroy. Therefore, he must follow Sonic's path back from the village to figure out where to send his demolition tractors. Suddenly, the signal from the transmitter on Sonic goes out completely, while Rotor's lab, which Sonic is still in, goes completely dark. A whole bunch of Freedom Fighters, led by Antoine, creep into the dark room. They quickly pounce toward Sonic and get into a scuffle, but, despite the effort, they don't catch Sonic. He calls out to Antoine, claiming his speed still helps him out despite the darkness. Hamlin, meanwhile, approaches Sonic and grabs him by the arm. Sonic calls him out as a rookie and easily tosses him aside. Taking advantage of Antoine, he calls him out as a coward, sending others to fight his battle. Antoine quickly grows angry and brandishes a sword, ready to battle one-on-one. He swings at Sonic, but misses, giving Sonic an opportunity to hit Antoine. He does, hitting him right in the head and knocking him out. Instantly after the hit, Arlo comes from the shadows and jumps on Sonic, but she too is thrown aside, right into Penelope. With the others done for, Sonic walks off in triumph to find the light switch. Suddenly, from behind, Dylan throws himself into Sonic, knocking the hedgehog out. Some time later, Sonic wakes up in a hospital bed in Knothole, with Rotor checking some x-rays and Sally sitting at the end of the bed. As he rubs his head from the hit, Sally asks him if he remembers anything. He tells her that he can't remember a thing, while she claims she thought he was a goner when Robotnik's demolition tractors destroyed the access tunnel to Knothole. Rotor, while analyzing the x-rays, has determined what set off the alarms while Sonic was going through the access tunnels. He takes out a pair of the tweezers and removes Robotnik's micro-transmitter hidden behind one of Sonic's ear. To make amends for the trouble he presumes he did, he puts his sneakers on and takes the transmitter, running off out of Knothole. As he runs off, Sally tells Rotor that they can't let him do his mission alone. With no more transmissions coming from the transmitter, Robotnik considers that option to find Knothole canned. Instead, he's going to try to find Knothole blindly. Before he can give the order, Sonic pops out of the Knothole tree stump entrance, in view of the demolition tractors. Snively gives note that the transmitter is transmitting again. Sonic drops back into the stump entrance, making Robotnik realize that his plan has not failed. He orders his tractors to pursue Sonic. From above, while Sonic lures the tractors, Tails follows the bots from the sky, sending reports to Sally. In one of the tunnels, Sally confirms, as she and some mole Freedom Fighters start her part of the plan. Sonic arrives, surprised, but she is able to convince him that he is better off to receive their help. He agrees, and hopes that if Robotnik follows him, their bots will hit a dead end. Robotnik watches the progress of his tractor bots from the sky, starting a countdown to demolition. As the countdown starts to the tractors' self-destruction, they approach a cliff, which has a cave that Sonic and the others are watching out of. At the last second, Robotnik notices the cliff, but he's too late as his bots drop off it, exploding from the detonation. With the threat of the tractors gone, and Sonic back to normal, he hopes that Robotnik will think that the tunnel is a decoy. Nonetheless, the tunnel needs to be remade due to the earlier work by the tractors. He also apologizes for his earlier actions, which Sally quickly accepts. She mentions that, through that experience, she now knows how he feels after their sparring matches. With another loss under his belt, Robotnik admits defeat with his plan, thinking he was led on a wild goose chase. Snively makes an off-hand remark, thinking that, with Sonic having no memory, that he won't remember making a goose out of Robotnik. Tails is still upset over being beat up by Sonic earlier. He tries to explain about being brainwashed, but Tails won't have any of it. He flies off the end of a cliff. He thinks that the Freedom Fighters are treating him like a baby, and arrives at the Sea Fox. He opens the cockpit, and starts it up, having replaced the oil in it, removed by Rotor, with some oil he recovered from an oil-soaked sea gull. He removes the dock rope from the submarine and sets sail out into the sea...all the while, Robotnik watches from a hidden camera in a tree on the shore. With Tails alone, Robotnik develops an idea to take out Tails, and help divide the Freedom Fighters. With one remaining duplicate from his recent war with Sally and Geoffrey St. John, he plans on using it to help aid his plan on conquering the Freedom Fighters, starting with Tails. While scouting the ocean, Tails comes upon an island that has not been charted before. He hears a loud call for help, so, thinking he's a mature creature and working alone, he decides to take on the task of helping the being himself. He docks the Sea Fox at the island and flies out. He arrives and instantly falls in love with who he sees: a female fox, tied to a tree. Completely infatuated, Tails gladly unties her from the tree, as she introduces herself as Fiona. After he unties her, they instantly gaze at eachother, leading to a both of them instantly falling in love with each other. They laugh and frolic around the island, while Robotnik gags as he watches his plan proceed. He's on the island, so he walks outside and sees the two through a telescope. Fiona offers to take Tails to her home den, which Tails accepts as he is completely brainwashed from love. He walks into the den first by recommendation of Fiona. From above, Robotnik appears and slams a gate door closed behind Tails, trapping him in the den. Robotnik then walks over and congratulates Fiona on a job well done. Tails' heart-broken, can't believe that Fiona is a robot, as she comes over and talks in a robotic voice. Robotnik then orders Fiona to activate a control panel near the den, which she does, ignoring Tails' pleas for help. The den Tails is in is actually a feeding tube to a huge roboticizing machine in the rocks. He keeps calling for Fiona to stop, but she has become a complete automaton, as Robotnik orders her to throw the switch to activate the roboticizer. She activates the roboticizer, with no remorse. He cries out for help as he's sucked into the roboticizer. Robotnik celebrates with glee, while Fiona, despite her robotic nature, starts to realize what she has done. Fiona Fox is introduced, in her robotic form. The Freedom Fighters that team up with Antoine are Sally's Freedom Fighters: Arlo, Penelope, Dylan and Hamlin. This issue brings about a change in the tone of battle in this comic series. Previous battles were usually done so in a comical way, while the battles in this issue depict serious bouts. While Tails frolics with the robotic Fiona, Robotnik mentions that there would be no way to tell him that he is in danger. He then references the term Maguffin, coined by Alfred Hitchcock. He even mentions the director's name directly. Full details regarding the Tails mini-series are revealed in Sonic-Grams.